Clear crystals are known as the “Feng Shui Aspirin”. When hung in the right place and in the right size they have the ability to redirect energy in all directions. They must be at least 40 mm in size, usually made of leaded glass crystal and be clear in color. Round crystals possess a great deal of sparkle and diffuse light/energy over a wide area. 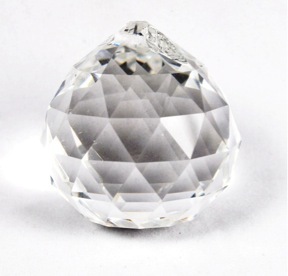 It is believed that when negative energy enters a faceted crystal it is deflected and turned into positive energy. How to clear and cleanse your home if it’s an apartment? Karen helped me target and clear some key areas of my home and the energy has been flowing ever since! Thanks Karen, can’t wait to see you again for some regular “tune-ups”!